I don’t think anyone enjoys cleaning their bathrooms. And they have to be cleaned so frequently! Since I wanted to spend less time cleaning my bathrooms, I went looking for things that could help speed up the chore. I found a few commercial products that might have done the job, but they were made with too many chemicals for me to use them comfortably. On top of that, the cost of buying them every month would have quickly added up! So I decided to make my own frugal DIY cleaning solution! 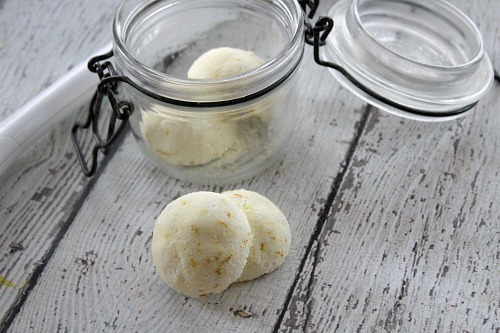 Thanks to these DIY Citrus and Lavender Toilet Fizzies you can get your toilets clean and sanitized with very little work! 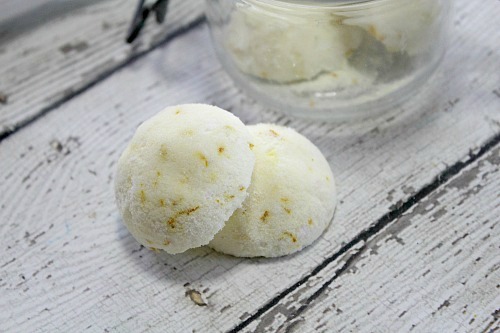 While the orange peel in this recipe is optional, it adds additional essential oils to the toilet fizzies. And I also just like the way the jar looks sitting on the counter with bits of fresh color! 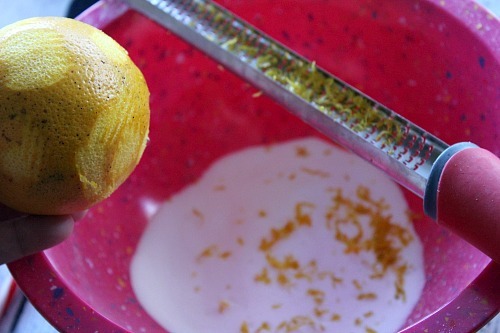 I often zest an orange or two before I pass them out to the kids and put the zest out to dry on a paper towel to keep for my DIY projects. As always, I recommend using a high quality therapeutic essential oil in your DIY recipes. If you can find essential oils that are both theraputic and organic, that’s even better! Fine mist spray bottle (optional- you can pick up a small one in the travel section at most stores). 1. 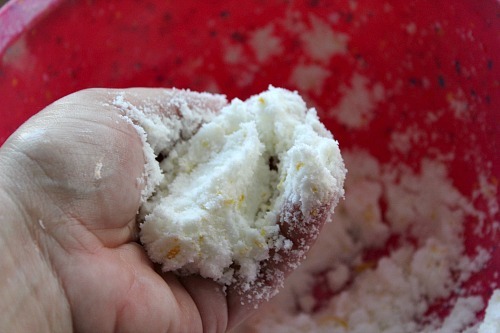 Combine baking soda, citric acid, and orange zest in a large bowl. 2. 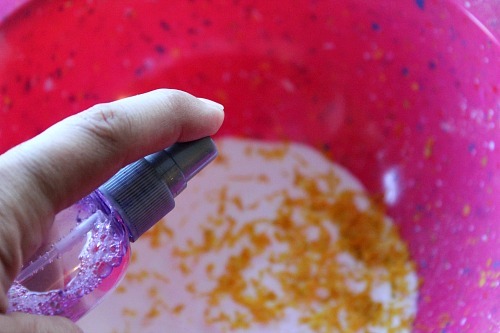 Add orange and lavender essential oil to dry ingredients, stirring well to combine. 3. Add water ½ tsp. 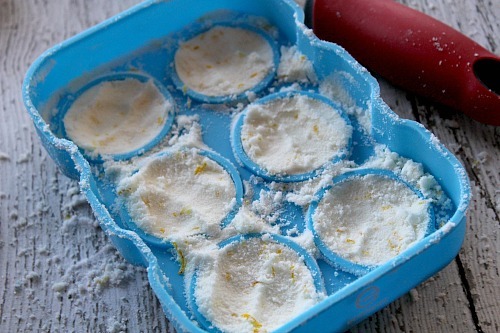 at a time and mix with your fingers until it holds together when squeezed but is just damp, not soaked. A fine mist spray bottle works best for adding water a small amount at a time. 4. Press the mixture firmly into the mold, pressing out all the air and compacting it tightly. 5. Allow to dry overnight before carefully removing each one from the mold. Store in an airtight container. Drop 1 to 2 toilet fizzies in your toilet bowl and let them fizz away. Let that sit for 5 minutes, then swish the bowl with your toilet brush, flush, and your toilet is clean! 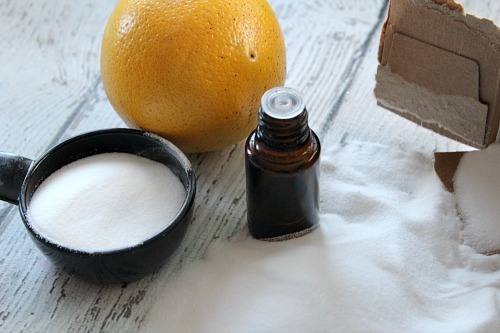 Have you ever used a homemade toilet cleaner before? Sounds easy enough! I’ll give it a try. Thanks for posting!